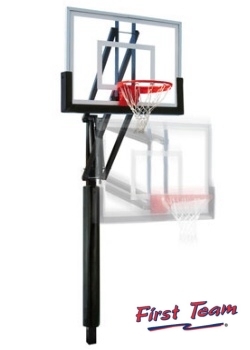 First Team�s Vector basketball system includes our heavy 11 ga. 4�x 4� post design that eliminates the risk of joint deterioration common with sectional type posts. 32" backboard to post extension. The Vector�s unique front-mount EZ Crank is a great choice, especially when a wall or other obstruction makes installing a rear-mount crank style impossible. First Team is the ONLY manufacturer to offer a front-mount EZ Crank with SPRING-ASSIST. Our spring-aided crank design is the easiest to operate in the industry and allows the rim height to quickly be adjusted anywhere from 10� down to 7�. The crank handle is removable to prevent unwanted adjustment. The clear and precise rim height indicator shows the rim height at all times. All Vector packages include a breakaway goal and net. A variety of acrylic backboards are available ranging from 36�x48� to 36�x60�. Choose the package that�s right for your home court. Portables: The Fury System is the most commonly sold system to church groups and youth groups, and any organization type where you know, more or less, who's going to play on it. It's heavy enough for aggressive adult play and more than stable enough for youth play. Lifetime Limited Warranty covers everything basketball related, including dunking, but not the SHAQ hang on the rim gorilla Vector.